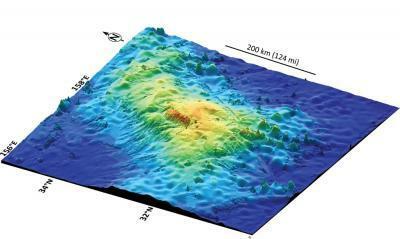 Researchers have uncovered the largest single volcano yet documented on Earth. Tamu Massif covers an area roughly equivalent to the British Isles or the state of New Mexico, making it nearly as big as the giant volcanoes of Mars and placing it among the largest in the Solar System. Tamu Massif covers an area of about 120,000 square miles. By comparison, Hawaii's Mauna Loa – the largest active volcano on Earth – is approximately 2,000 square miles, or roughly 2 percent the size of Tamu Massif. Olympus Mons on Mars has a giant volcano visible on a clear night with a good backyard telescope, and that is only about 25 percent larger by volume than Tamu Massif. "Tamu Massif is the biggest single shield volcano ever discovered on Earth," says lead author William Sager, a professor in the Department of Earth and Atmospheric Sciences at the University of Houston. "There may be larger volcanoes, because there are bigger igneous features out there such as the Ontong Java Plateau, but we don't know if these features are one volcano or complexes of volcanoes. "It's not high, but very wide, so the flank slopes are very gradual. In fact, if you were standing on its flank, you would have trouble telling which way is downhill. We know that it is a single immense volcano constructed from massive lava flows that emanated from the center of the volcano to form a broad, shield-like shape. Before now, we didn't know this because oceanic plateaus are huge features hidden beneath the sea. They have found a good place to hide." 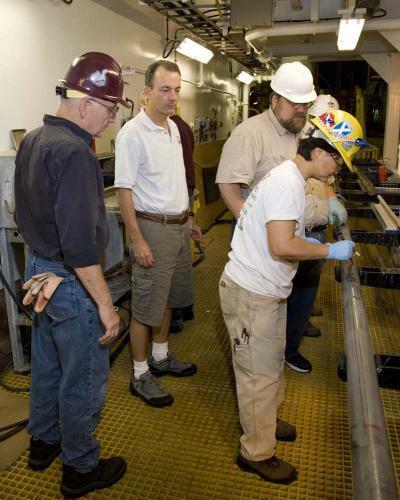 The study relies on two distinct, yet complementary, sources of evidence – core samples collected on Integrated Ocean Drilling Program (IODP) Expedition 324 (Shatsky Rise Formation) in 2009, and seismic reflection data gathered on two separate expeditions of the R/V Marcus G. Langseth in 2010 and 2012. "It's shape is different from any other sub-marine volcano found on Earth, and it's very possible it can give us some clues about how massive volcanoes can form," Sager said. "An immense amount of magma came from the center, and this magma had to have come from the Earth's mantle. So this is important information for geologists trying to understand how the Earth's interior works."